Yadvinder works in the Geography department at Oxford University. He looks at how human activity and especially carbon dioxide emissions have changed the ecosystems of tropical rainforests. This work takes him on regular trips to his two research sites in the Amazon basin. Scientists have calculated the amount of carbon that is being produced by man’s activity, but there’s a shortfall in the amount of carbon that can be measured in the air. It must be being absorbed into the land, but where? This is one of the main questions Yadvinder is trying to answer. At his research sites in the Amazon, Yadvinder uses ultrasonic devices which sample air speed and direction twenty times a second. By analysing the composition of the air, he can very accurately model the vertical carbon movement. Old, established forests should absorb and give off equal amounts of Carbon as plants grow and decompose. 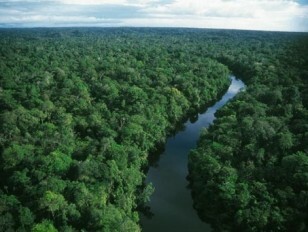 But Yadvinder has discovered that the rainforests are now absorbing more carbon than they give off. The trees are also starting to grow faster and die younger than they were twenty years ago (10% shift). But is this being caused by man’s activities? Yadvinder has recently started a UK based research programme to see if the changes in the Amazon are also taking place in Northern Europe. He is looking at an ancient woodland near Oxford called Wytham woods. It’s one of the only untouched ancient woodlands left in the UK. Yadvinder thinks that global climate change will be the biggest societal challege of the century. He claims that 99% of scientists working in this area agree that global warming is the caused by human activity and is a serious threat to the future of the planet.